I am afraid this is such a familiar verse we have lost the depth of this gift from God, the Father. Christmastime is the gift of Jesus, our Savior sent from heaven to come down to earth. We could not get up to Him, so He came down to us. God gave the only and best He had, His perfect only Son. No one was left out. This gift was sent to the whole world. Do you feel giftless this Christmas, or do you feel overwhelmed with gifting? Receive and give the only gift that matters! It is the only gift that continues to give after the hype is over. His gift to us never ends. It brought all that is truly good, holy, and perfect in every way for eternity! That "Gift" is all that deserves my attention and heart during this season. .Gift all of your heart to Jesus. He alone is worthy! 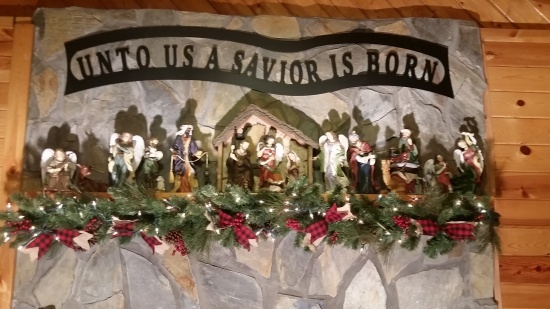 Christmas time at Eagle’s Nest is proclaiming the good news, "For unto us a Savior is born!"